Credit cards rank pretty high on the list of things you hate to lose, somewhere between your kids and car keys. A lost or stolen credit card has the potential to cause plenty of damage, especially if you have a high credit limit or a lot of available credit or both. Because the last thing you want is damage to your credit at someone else’s hand, it’s crucial that you know what to do when your credit card has been lost or stolen. Acting quickly is key. The first thing you should do is report your missing credit card to the card issuer. Don't wait; make the call as soon as you notice your card is missing. Normally you'd find your credit card issuer's number on the back of your credit card. Of course, that's not an option if your credit card is missing. Instead, look for your credit card issuer's phone number on a copy of your credit card statement. If you have online access for your credit card, you may be able to use the website to report your missing credit card. Just make sure you use your credit card issuer's true website and not an imposter site. After you’ve contacted the card issuer by phone, it can be helpful to follow up with a letter stating that your credit card was lost or stolen. Include the account number, date of loss or theft, first date the loss was reported, and the last authorized transaction. This letter provides proof that you reported the loss and the time of the report, should that fact ever come into question. When fraudulent transactions are made on your credit card, the Fair Credit Billing Act (FCBA) protects you. Under federal law, if unauthorized charges are made with your credit card, the maximum amount you can be liable for is $50. If the charges are made after you report the card as lost or stolen, you have no liability. However, if the charges are made before you report the loss, your creditor can ask you to pay up to $50. That’s why it’s important to report your missing credit card as soon as possible. Many credit card issuers have a zero-fraud liability protection benefit that eliminates your liability for any fraudulent charges as long as the card is reported missing within a certain period of time. Ask your creditor if such a benefit applies to your account. Review your billing statement for a few months even after the loss to catch any unauthorized charges made using your credit card. If you see any charges that you did not make, report them to your creditor immediately. Know where your credit cards are at all times. Carry the credit cards that you’ll need and leave the others at home in a secure place. Check periodically to make sure you still have all your credit cards. Place your credit cards in a wallet or purse rather than directly into your pocket where it's easier for them to slip out. Make sure your cards fit snugly inside the slots of your wallet. 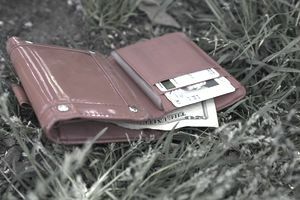 If the slots have become loose or worn, consider purchasing a new, stiffer wallet that will hold your credit cards securely in place. If your credit cards are inside a wallet or bag, always keep it closed and close to you. The FBI once prosecuted a thief who crawled under movie theater seats to steal credit cards from women's purses. Create a contact list including the name and number of all your card issuers. Store the list in a safe place so that you can easily reach your card issuers if a credit card is lost or stolen in the future. You don't have to write your credit card numbers on the list—and it's probably safer not to write the full number—since your card issuer can typically locate your account using other personal information.